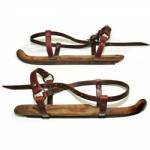 The owner of these old ice skates asked me to make new leather straps similar to the originals. I had only fragments of the old straps to study, but I was able to figure them out after much head scratching and internet research. Click "See more images" to see what the fragments of the old straps looked like and how the straps lace around a person's shoe. The narrower straps are made from latigo leather which is tanned to be strong yet pliable. After breaking in, the latigo straps will conform to the person's shoe and lay flat. The wider heel strap is bridle leather which is sturdy and firm. I able to reuse only a few of the original buckles and rings. Some parts were missing and others were badly rusted and weak. I found buckles and rings similar in size and shape in my stash of old hardware.